KNU7 is my second submission for the ongoing collaborative Judgement Day Project. A lot of my recent hobby output has been robot related, including my first Judgement Day figure, Walter and a big proportion of my Construction Crew. 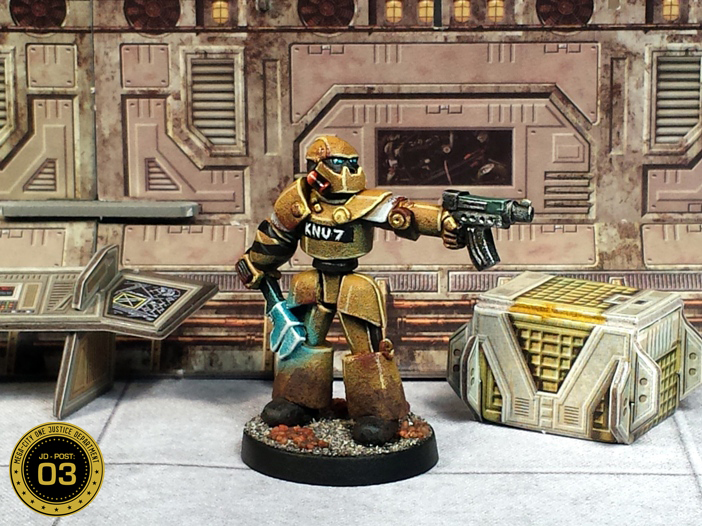 This Mongoose Publishing/Warlord Games Renegade Robot is armed and therefore didnt fit in with the non-combatant Crew, so I included it here instead. 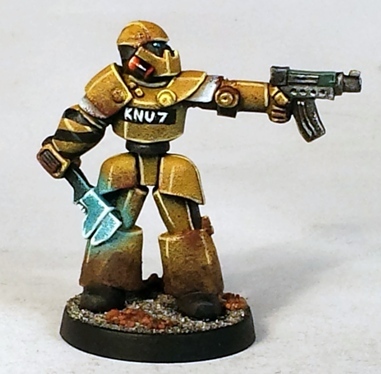 I guess that KNU7 was content with his lot until recently when he broke his programming. A large robot working with a twentieth century hand tool felt a little too daft even for my tastes, so I painted with a glowing effect: now its a hydro-spanner or nano-wrench or something. It brightens up the model nicely. I also added a simple orange beacon effect on either side of his head in keeping with the other similar models in the Construction Crew. After a busy few days I am now a little ahead of myself on this project, so I have a couple of options regarding what I will put up for Judgement Day #5 in a fortnight. It might be another robot or it might be a different sort of perp, I havent decided yet. That’s a beautiful job, Paul. Love it. Great light effects. Thanks Andrew. I have been experimenting with the lighting effects here and there for a few months. This guy is probably the the most successful example to date. Thanks Asslessman. The painting on this model is identical to that on the “Big Jobs” tutorial that I put up a few weeks ago, with the addition of the green on the spit pistol. As you can see from that, none of the individual steps are terribly difficult. I love the idea for the spanner Paul nice one. Excellent. The osl on the wrench works super well. The weathering and grit on his body is great, you’ve got the robot thing down pat. Nothing like putting a few similar models through the process to boil it down to what actually matters. I have painted about twenty figures in this scheme recently, so I would hope that it would be after getting a little more refined. KNU7 isnt the last of these either.